John Stephenson, who plays the Showroom Announcer, was the voice of Mr. Slate Flintstones TV movies. Harvey Korman, who plays Colonel Slaghoople, was the original voice of The Great Gazoo in The Flintstones TV series. The song that the showgirls danced to, — Rise And Shine, —  was used as the beginning and end credits theme song for the first season of the animated series. The creators of the original animated series, William Hanna and Joseph Barbera, can be seen briefly during the wedding scene at the end of the picture. There’s one quick shot of the two of them together singing along to the Flintstones theme song. Rosie O’Donnell, who provides the voice of the Octopus Masseuse, played Betty Rubble in the 1994 film. Harvey Korman did the voice of the Dictaphone in the 1994 film. On the shelf in Betty’s kitchen is a box of Post Fruity Pebbles, a real-life breakfast cereal derived from the original animated series. The producers opted for the prequel approach in this second film mainly due to John Goodman’ s refusal to reprise his role as Fred Flintstone. 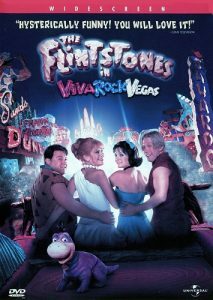 Although several actors from the first live action The Flintstones (1994)movie have roles in this movie, only Irwin Keyes is the only actor to portray the same character, Joe Rockhead. Jane Krakowski was cast in this film after Steven Spielberg met her at an awards show and asked her to do the part.